In January 2019, Champion SLU, LLC successfully completed the refinance of the Acquisition Bridge Loan with the Senior Refinance Loan. We are excited to own Union Bay Apartments over the long term. 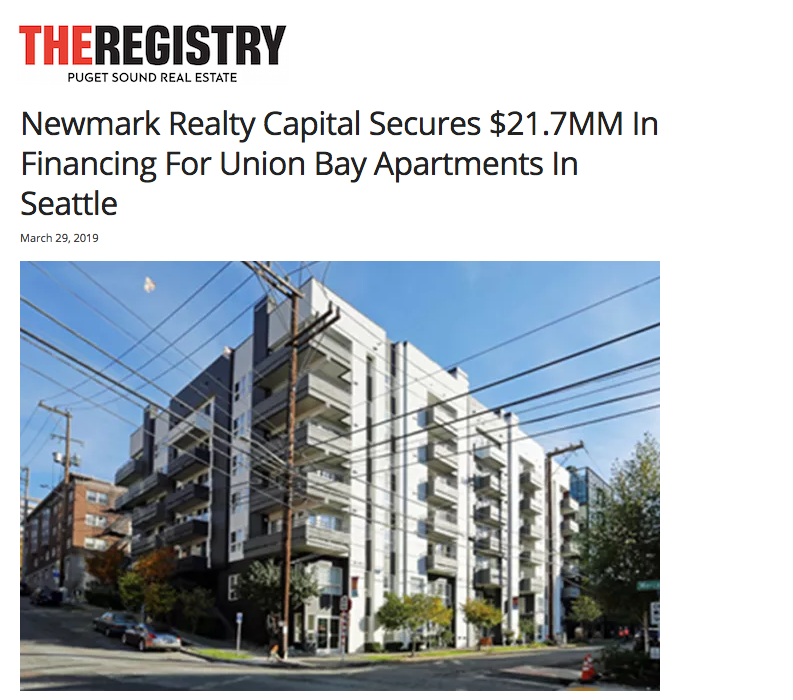 The property is a low leverage, Class A property in the core South Lake Union submarket with strong and growing annual cash distributions with forecasted continued asset appreciation. 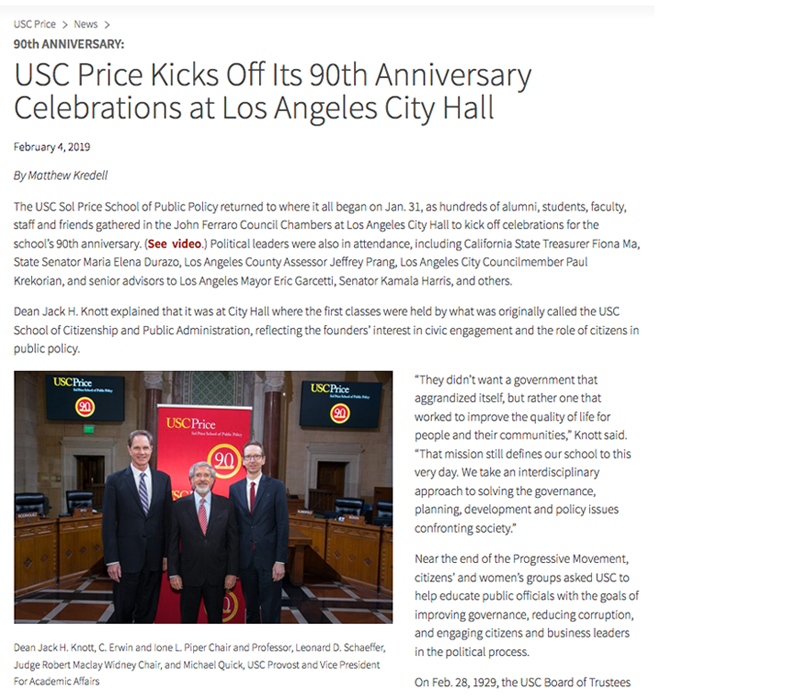 In 2019, the USC Sol Price School of Public Policy celebrates its 90th anniversary. This momentous occasion represents a major milestone in the history of the School. At an awards dinner earlier this week, Bob Champion was recognized as a Price Pioneer in Real Estate development. A video showing those recognized can be found here. Champion Real Estate Company is doubling up on its investment in Glendale multifamily projects this year. The company said it paid $14.12 million for two apartment properties in Glendale. This comes after the firm bought two other apartment complexes in Glendale for $33.6 million earlier this year. The most recent acquisition includes a 36-unit apartment community at 348 W. Chevy Chase Drive, and a 26-unit community at 1119-1123 E. Elk Ave. Champion will begin a $2.6-million renovation for both the interior and exterior. The plan includes retrofitting both properties and addressing deferred maintenance issues, Champion explained in a release. Student housing is generally more resilient than multifamily in a downturn, and the current tight supply of student housing in Los Angeles is putting upward pressure on rents. Student housing is having a moment. A tight supply of student housing is putting upward pressure on rents—even more so than the tremendous rent growth in multifamily. But, the strong rent growth isn’t the only reason to buy student housing. The apartment niche is also more resilient in a downturn than multifamily, and as we get later in the cycle, downside protection is attractive to investors. Champion Real Estate Co. is actively investing in student housing assets near USC, and is very bullish on the sector. An affiliate of Champion Real Estate Company has sold the redeveloped Grand & Alosta in Glendora to Clarion Partners. HFF, which represented the seller declined to provide a price, but a source with knowledge of the deal said it sold for $34.2 million. Clarion Partners acquired the 70,811-square-foot grocery-anchored retail center at the intersection of Grand and Alosta Avenue along Historic Route 66. The property is co-anchored by Sprouts and Marshalls and is 100 percent leased, according to a release from Champion Real Estate. West Los Angeles-based Champion Real Estate Co. has secured a $28.5 million loan to purchase a nearly three-acre property to build a townhome project. The 75-year-old John Tracy Clinic, sold the property at 806 West Adams Blvd. to Champion Real Estate. The clinic, which provides services to parents and families of children with hearing loss, was founded by actor Spencer Tracy’s wife, Louise, in honor of their son, John. The purchase price for the land was $26 million, or $422.88 per square foot, according to CoStar data. JANUARY 31, 2018 (Los Angeles, CA) – Champion Real Estate Company (“Champion”) recently completed the acquisition of two multifamily buildings for $33.6 million in the city of Glendale, California, which buildings are owned by a subsidiary of Champion, Champion Glendale Property, LLC. This purchase is an off-market acquisition that was negotiated simultaneously for the two buildings, totaling 104 market rate apartment units. The two properties are located less than two miles apart. Princess Louise (“Louise”) was built in 1970 with 42 units, and Windsor Real (“Windsor”) was built in 1972 with 62 units. The properties include a large percentage of multi-bedroom units with an average size of 951 square feet. Glendale and the cities of Burbank and Pasadena comprise the Tri-Cities of the eastern San Fernando Valley/Western San Gabriel Valley. The Tri-Cities are highly sought-after locations with strong schools, clean and accessible community parks, renowned shopping and restaurants, as well as relative affordability in the Los Angeles metro area. “The Glendale apartment market is largely bifurcated with the vast majority of units either being new construction or dated and untouched 1960’s and 1970’s product. With a comprehensive improvement plan, Louise and Windsor will provide an upgraded, clean and professionally managed living experience at a steep discount to the new construction,” states Parker Champion, Executive Vice President. “Providing larger-sized homes in an updated apartment community while maintaining affordability in such convenient and desirable locations will offer the Glendale community with more options to enjoy the desired lifestyle,” comments Parker. Champion has over 30 years of experience in the multifamily market and previously completed similar value-add investment acquisitions including Villa Olive in Burbank, Casa Laguna in Los Angeles, Union Bay Apartments in Seattle, and Ancelle in Koreatown. Louise is located at 720 N Louise St and Windsor at 1377 E Windsor Rd. Champion Real Estate Company (“Champion”) was founded in 1987 by veteran investor, developer and CEO, Bob Champion. Based in West Los Angeles, Champion’s strategy is to acquire infill properties in “A” locations within markets that are core, core adjacent or gentrifying to core and implement value accretive improvements. For more information, visit www.ChampionRealEstateCompany.com. GLENDORA – Champion Glendora, a grocery-anchored neighborhood retail center located at 655 S Grand Ave in the City of Glendora held its grand opening on Wednesday, May 24th, 2017. The opening was celebrated with the City of Glendora, Glendora Chamber of Commerce, and the center’s tenants, inaugurated by a ribbon cutting ceremony. A half-acre property north of the USC Campus is being transformed into a luxury student housing complex by local developer Champion Real Estate Company. The Victory on 30th, located at the northwest corner of Vermont Avenue and 30th Street, will consist of a four-story building featuring 24 two-bedroom apartments and residential amenities. Construction crews are already shaping the wood skeleton of the low-rise development, which renderings show will exhibit an industrial aesthetic, featuring an exterior of brick and metal panels. 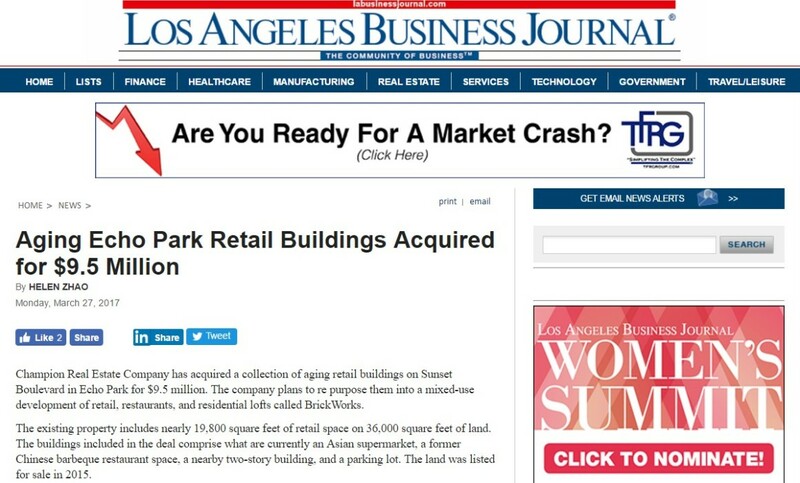 Champion Real Estate Company has acquired a collection of aging retail buildings on Sunset Boulevard in Echo Park for $9.5 million. The company plans to repurpose them into a mixed-use development of retail, restaurants, and residential lofts called BrickWorks. The existing property includes nearly 19,800 square feet of retail space on 36,000 square feet of land. The buildings included in the deal comprise what are currently an Asian supermarket, a former Chinese barbeque restaurant space, a nearby two-story building, and a parking lot. The land was listed for sale in 2015. BrickWorks will span 1485 to 1501 W. Sunset Blvd. It will include 15,000 square feet of retail space and a food court-style collection of eateries and restaurants. The number of residential units is currently being planned. “The acquisition of BrickWorks is consistent with Champion’s strategy of acquiring properties at discounts in ‘A’ locations and we continue to focus on sourcing similar deals in surrounding neighborhoods,” Garrett Champion, senior vice president of Champion said.